Looking for reasons to celebrate in April? It’s a quiet month here in Highlands, NC and across the rest of the Plateau. Easter Sunday and April Fool’s Day, both of which fall on Sunday, April 1, start the month off. Then, for the environmentally-inclined, Earth Day is Sunday, April 22 and Arbor Day follows on Friday, April 27. And that’s it. Friday, April 6 is “Walk to Work Day.” This is one of the great things we love about living in Highlands and Cashiers, NC: both towns are extremely walkable. Because Highlands has a vibrant downtown with plenty of fine dining, specialty shops and fashion boutiques, homes that are within walking distance of downtown Highlands are in high demand. Cashiers is very flat within town and has a pathway that extends through the village, taking you by antique shops, restaurants, and through the Village Green. Even if you are lucky enough to have retired from work, living in either one of these towns would give you easy access to all the action. Thursday, April 12 is “Grilled Cheese Sandwich Day.” This just might be our new favorite holiday! There’s not much better than a gooey, buttery grilled cheese sandwich – especially when paired with tomato soup. However, if you want to amp up the gourmet factor, why not try this recipe from Wolfgang Puck? Heat a nonstick skillet or griddle over medium-low heat. 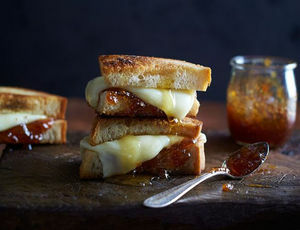 Spread fig jam on four slices of bread and spread honey on the other four slices. Layer with cheddar and mozzarella; sandwich the slices together. Brush the bread with butter. Place the sandwiches, butter-side down, in the hot pan. Brush the other sides with butter. Cook until golden brown and the cheeses have melted, five to seven minutes per side. Transfer sandwiches to a cutting board; let them rest for one minute. Cut into quarters and sprinkle with a pinch of sea salt. Serve hot.